The British Gazette » Remembrance Sunday: We will remember them. 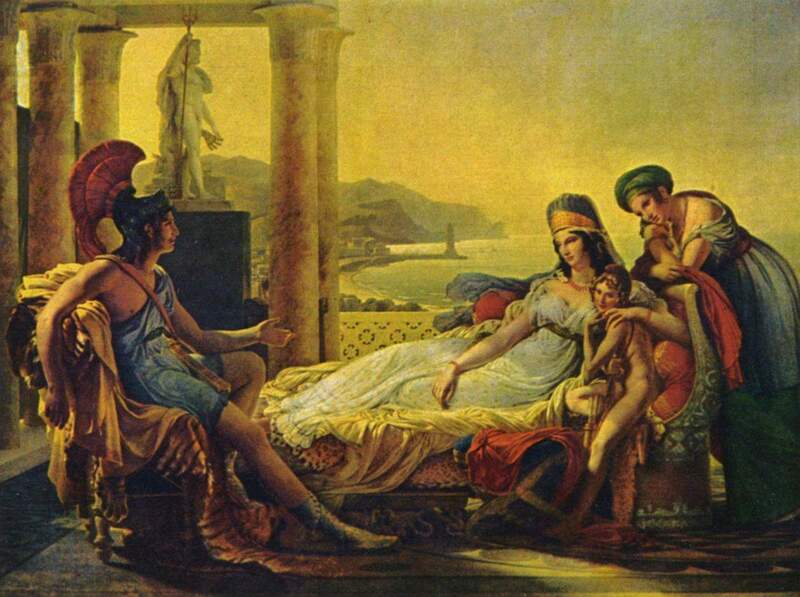 Above, Pierre-Narcisse Guérin’s 1815 painting of Aeneas recounting the Trojan War to Dido. Click on the image for full size. One thing this organ is known for is its uncompromising stance towards the Brussels Brainwashing Commissariat, chief cheerleader for everything that is politically correct, “Green” and Europhile. However, where credit is due, due credit should be given and this organ does so insofar as the BBC’s coverage of the national remembrance led by the Queen this morning at the cenotaph. Of course, for those youngsters at school, Remembrance Sunday must feel like the conclusion of a week of public mourning for -as so rightfully scribed on the cenotaph – Our Glorious Dead. Poppies are worn prominently for some time by public figures and TV broadcasters and we now seem to have not one national act of remembrance but two. There is now the act of remembrance unofficial but now near universally observed act at 11:00AM on the 11th November and the official act, mentioned. Our treasonous politicians of course talk the talk of paying tribute to the UK’s finest but feloniously fail to walk the walk of defending the sovereign prerogatives of the Sovereign Lady to whom as Privy Councillors they have pledged their allegiance. It would seem that the group of Quislings that run our country somehow think that if they afford the public the full and sombre panoply of official solemnity they will be excused and not be held to account for their treasons. A particular poignant and mournfully harmonious element that is a regular feature of the nation’s commemoration are the massed bands of the Household Division playing Dido’s Lament from Purcell’s magnificent opera Dido and Aeneas. This is perhaps a fitting moment to remind ourselves of the aria’s libretto and the background to the scene in the opera. Remember me! but ah! forget my fate. This scene and these words are an apt metaphor for the present state of affairs in the UK, the Queen acting on the advice of her minsters having rejected the country’s sovereign status, instead placing the country under the rule of the malign influence of the EU – the Sorceress of the opera?